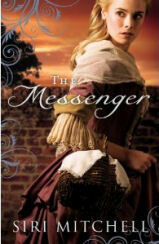 This week, CFBA is introducing The Messenger by Siri Mitchell. books to read, that as soon as I finish one, the next book is usually started within a few hours. Sometimes it can be hard to change gears to the new book when my mind is still on the old one. I’m afraid that happened with The Messenger. I just finished The Sweetest Thing by Elizabeth Musser (very good, by the way), which is set in the Depression era. Musser’s book is written in the first person with two main characters that each writes every other chapter – or sometimes switching perspectives several times within a chapter. Siri wrote The Messenger the same way – in the first person with two main characters that each writes every other chapter. I just had a hard time focusing on the story, after finishing such a similarly different (?!?) book! The plot sounds great, and I have enjoyed Siri’s books in the past. I just couldn’t get past the first 5 chapters and into this story! I believe if I pick it up again during a lull, I’ll be able to finish and enjoy it. I'll update my review when I do! If you’ve read it, I’d be interested in knowing your thoughts! Thank you to Siri and Bethany House through CFBA for sending me a review copy!